To keep integrity and safety of PCB boards during the manufacturing, shipping, and assembly processes, PCB penalization is a good way to maintain. Penalization allows PCB manufacturers to assemble multiple boards simultaneously, reducing costs and production time. Penalization must be done properly so that PCBs will not be broken or otherwise damaged during separation. Penalization, also known as an array format, is used to process multiple boards while keeping them together in a single substrate. The process allows PCB manufacturers to maintain high quality while reducing costs. The two most common methods of penalization are V-groove penalization and breakaway tab, or tab-route penalization. V-Groove Penalization – This method involves cutting 1/3 the thickness of the board from both the top and bottom with a 30- to 45-degree circular cutting blade. The remaining board is quite sturdy and is depaneled by machine to avoid stress on the PCB. V-Groove penalization is used where there are no overhanging components. Tab-Route Penalization – This method permits placing PCBs of the same or different designs together. Space is left between the perforated tabs and the traces and surface mounted parts. This reduces surface stress and avoids splintering. 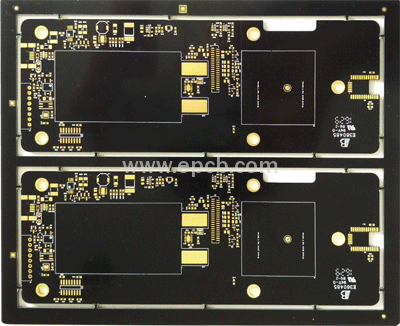 EPCB is not only good at PCB penalization, but can design the panel way for you out of charge.